I'm from Gadsden, Alabama currently living in beautiful Rainbow City, Alabama. 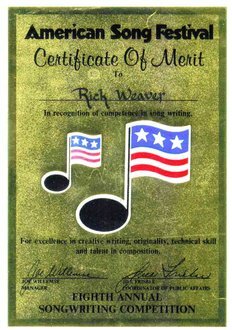 I started writing songs while I was in High School around the age of 17 (1973). The first one was a little ditty I called "Something Has Happened to our Love". I continued to write until about 1985 then I married, quit playing music for a living and started my "grown-up" stage in life. I played professionally until 1986 when I became active in church and became a choir director for about 11 years. In March of 2001 I started putting together a very good home recording studio and got busy writing and recording demos of my songs both new and old. It's funny how Pop/Rock songs written in the late 70's and early 80's are now Pop/Country songs. In June of 2002 my best friend, Terry Williams (Tadpole) and I began performing live as a duo known as "Rick and Tad". This effort has greatly improved our "chops" and given us an opportunity to get immediate reaction to some of our original material. This would've been around 1978. The song was "Heard It All Before" co-written with Barry Lipkin. 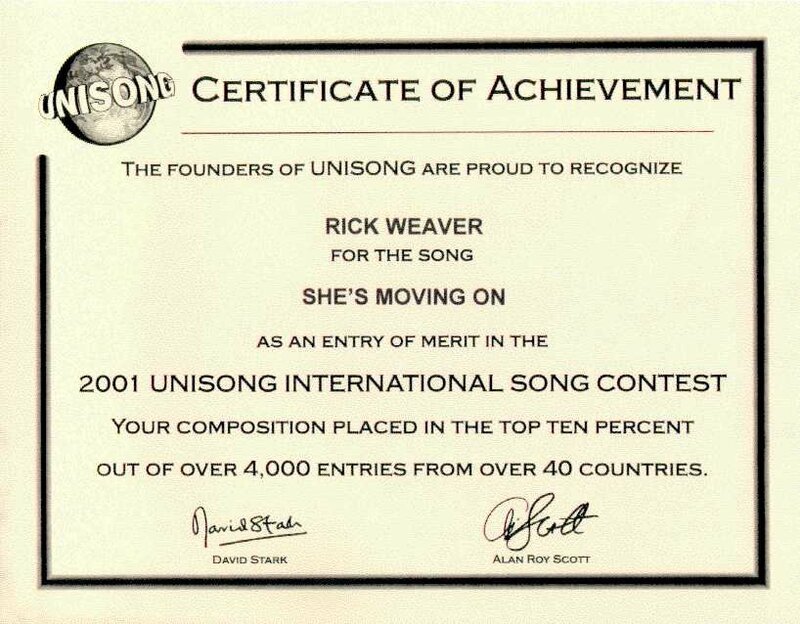 July 23, 2002: I just received this certificate from The Unisong 2001 International Song Contest. I take this recognition as confirmation that maybe I can still write a decent song. The song was "She's Moving On". 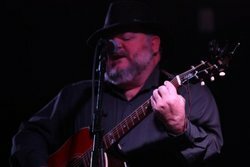 I will be adding new songs as they are finished so please check back often.